When Austin Lachance began his filmmaking career while a sophomore at the U.S. Military Academy, he didn't own a camera. But he did have a story. 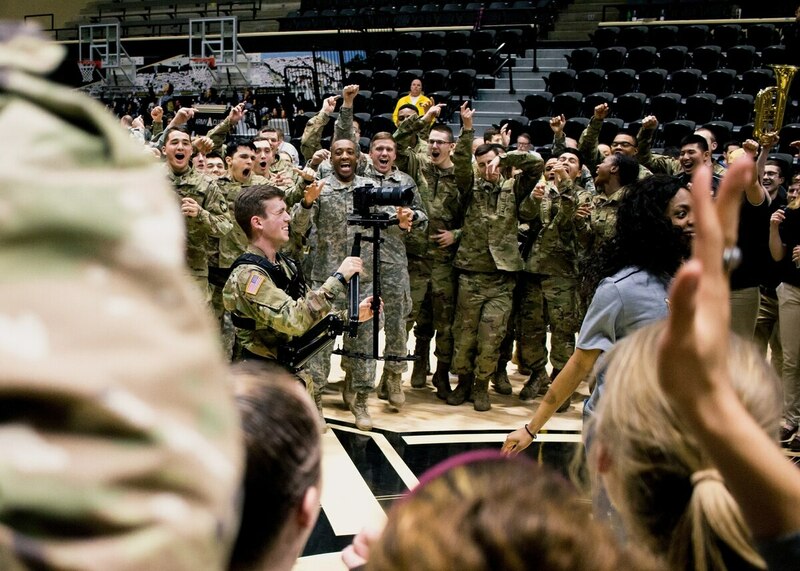 A tuba player in the West Point spirit band, Lachance and his friends were kicking around ideas for a spirit spot – a short video designed to pump up the Army faithful before the annual football rivalry game against Navy. The brainstorming session, while fruitful, became a bit unwieldy. "I was basically able to come up with a coherent premise with these good ideas that they were tossing against the wall to see what stuck," said Lachance, 21, who'll graduate West Point on May 27. "I had this great premise, but I didn't own a camera or any software at the time, so I was running around West Point, trying to find someone who could help make it." The short film would launch Lachance's directorial aspirations, and by his senior year, he was ready to submit two of his productions to the GI Film Festival, which kicks off in Washington, D.C., three days before Lachance graduates.
" Child's Play," his 2016 spirit spot, meshes young children acting out war games with footage of cadets in training, ending with the tagline "Kids play soldier, not sailor." And " Ghostly Assemblage" honors fellow West Point cadets who died during their time at the school – a somber, wordless tribute that covers much of the hallowed campus. Both films were accepted into the festival. "We wanted to include them for two different reasons," said Brandon Millett, the festival's chairman and co-founder. The first showed "a different, humorous side of our warriors," he said, and the second, "in stark contrast, honors the soldiers we've lost over the last year, certainly an appropriate and poignant message for Memorial Day weekend." Lachance won't attend the festival, with one film showing on the eve of graduation and the second on the day after, when he's booked to shoot a fellow cadet's wedding. His commissioning will make him the only active-duty filmmaker participating in the event. He won't be the first academy filmmaker in the spotlight, however: Rylan Tuohy (Naval Academy '16) had two films featured in the 2016 festival, including "Naptown Funk," a music video that took GIFF's Best GEICO Military Short award. Rivals in the spirit spot wars but friends on social media, Lachance saw Tuohy's festival posts and thought, "Aw, man, there's such a thing as a film festival for military folks?" It was too late for 2016, but he was on board for the following year. The large-production 2015 spot featured Caslen among a cast of VIPs, mascots, cheerleaders and, yes, a War Tuba or two. The production "included buy-in from every single West Point key leader," Lachance said, and involved a strike team of spirit warriors beginning their mission via a "preposterous Chinook shot." "When it's Branch Week, you happen to have a Chinook on your front lawn," said Lachance, who hopes to become a Black Hawk pilot and will and report to Fort Rucker, Alabama, for training after graduation leave. "One of the little mantras that I tried to spread around, that I tried to instill, was 'When, not if,' " Lachance said. "The idea behind that was, how do you rally people behind something after 14 years of loss? How do you get people to buy into something that is historically against you? "We had just a so much more compelling story. If Navy won, that would just be status quo. When we won, it was one of the greatest sporting moments for an entire branch of the military." Learn more about the GI Film Festival at MilitaryTimes.com/gifilms.